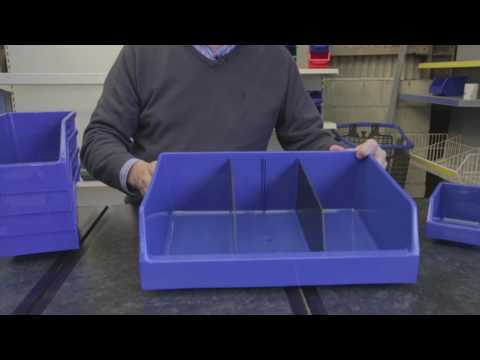 We stock high-quality and durable plastic parts bins that are designed to withstand commercial and industrial environments. Our Parts Bins range come with an open front design and are great for storing small parts such as nuts & bolts, screws, buttons & craft materials as well as other bits and bobs! Our Parts Bins can be used in any setting and are widely used in factory & workshop environments, offices, garages/sheds etc. This bin can be used with our louvre panels or used on a shelving system. The bin is also nestable which means that empty units can be placed inside of each other – this therefore means that these are not stackable so cannot be placed on top of each other. This is a durable and robust bin that is best suited for smaller fittings. Check out the rest of the range for both larger and smaller sizes. The design of this bin also allows for labels to be placed on the front (labels not provided) and the ‘feet’ on the bottom of the bin helps prevent slipping on smooth surfaces.